The 2018 PMF Academy (the Orchestra and Vocal Academies) consisted of 102 young musicians from 22 countries and regions, selected from among 1,190 applicants. The 98 members of the Orchestra Academy were led by Artistic Director Valery Gergiev, Principal Conductor John Axelrod, and Guest Conductor Edwin Outwater for their main programs, and instructed by PMF EUROPE and PMF AMERICA. Many works by PMF-founder Leonard Bernstein were performed, in celebration of the 100th anniversary of his birth, including highly popular performances of his "Serenade after Plato's Symposium" with violinist Midori, who made her first return to PMF since the first PMF in 1990. 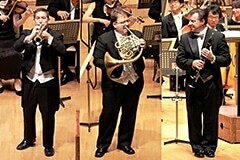 Three members of PMF AMERICA served as soloists with the Sapporo Symphony Orchestra, garnering high praise. 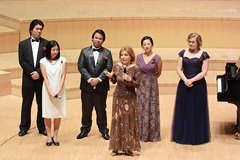 The 4 members of the Vocal Academy, instructed by soprano Gabriella Tucci performed on the Picnic Concert and GALA Concert including performances with the PMF Orchestra. Also, the Asian Fellowship Program was established, with 4 members attending from 4 countries. 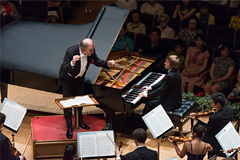 Efforts were made to reach young people, with music outreach programs including a series of PMF Open Master Classes, implemented systematically for the first time this year, featuring PMF faculty instructing local music majors, and new "Youth Wing Seats" that allowed audience members 25-years-old and younger to attend orchestra concerts for free. Forty concerts (including pre-concerts) were held during the 26-day festival, in Sapporo, Tomakomai, Hakodate, Naie, Hiroshima, and Tokyo. Prior to the concert in Hiroshima - PMF's first in 19 years - the Artistic Director and Orchestra Academy visited Hiroshima Peace Park and the Memorial Museum, as an expression of the desire for peace central to the concept of PMF. The 2017 PMF Academy (the Orchestra, Conducting, and Vocal Academies), consisted of 97 young musicians from 29 countries and regions, selected from among 1,235 applicants. 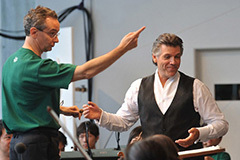 The Orchestra Academy was instructed by PMF EUROPE in the first half of the festival and PMF AMERICA in the second half, giving many performances including Program A and Program B led by Principal Conductor Jun Märkl and Program C led by Artistic Director Valery Gergiev, in addition to the Bernstein Legacy Concert, the PMF Link Up Concert, and many chamber music concerts. Maestro Märkl simultaneously served as instructor for the Conducting Academy, whose 3 members conducted part of Program B after their week of lessons and rehearsals. The 4 members of the Vocal Academy were instructed by soprano Gabriella Tucci before performing on the GALA Concert and the Picnic Concert. Music outreach programs included a student orchestra rehearsal being led by Maestro Märkl, the Brass Clinic, Open Violin Lessons, and more, providing opportunities for local young musicians to receive world-class instruction. Concerts were held not only in Sapporo, but also in Tomakomai, Hakodate, Obihiro, Naie, Kawasaki, and Tokyo, totaling 39 concerts in a span of 25 days. The 97 members of the Orchestra, Conducting, and Vocal Academies, from 28 countries and regions, were selected from among 1065 audition applicants. In the first half of the festival, John Axelrod, Artistic and Musical Director of the Real Orquesta Sinfónica de Sevilla, conducted 2 programs as PMF Principal Conductor, in addition to instructing the Conducting Academy. Artistic Director Valery Gergiev, in his 2nd year since being inaugurated, led the final program, with 5 concerts in 4 cities: Chitose, Sapporo, Hakodate, and Tokyo. The Vocal Academy was led for the 2nd year in a row by soprano Gabriella Tucci. 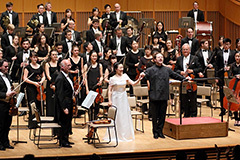 The Bernstein Legacy Concert, with music connected to PMF's founder, was conducted by PMF alumnus/faculty member Daniel Matsukawa. In addition to these, Outreach Concerts, the Link Up Concert, and other programs aimed at developing music rooted in the local community were held in various locations, bringing the total number of PMF concerts to 38 in a span of 25 days. Auditions were implemented online for the first time, with 85 participants from 24 countries and regions chosen from among the 998 applicants to form the Orchestra, Conducting, and Vocal Academies. 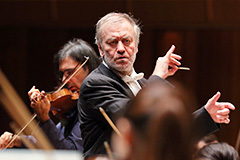 Valery Gergiev was inaugurated as PMF's sixth Artistic Director, and the PMF Orchestra, along with soloist Dmitry Masleev - first prize winner of the International Tchaikovsky Competition, piano category - gave 4 performances of < Program C >, representing the culmination of their time together, in Sapporo, Yokohama, and Tokyo. The PMF Orchestra was also instructed by Principal Conductor Jun Märkl and Guest Conductor Andris Poga. The Conducting Academy performed Mozart's Symphony No. 34 and more under the instruction of Mr. Poga. The Vocal Academy was instructed by Ms. Gabriella Tucci (soprano). Educational programs were implemented for elementary and junior high school students as part of a wide range of programs designed to encourage music rooted in the local region. PMF Stage Opera in Kitara "Ariadne auf Naxos"
Chosen from among 1,351 applicants, 122 Academy members from 26 countries and regions participated. 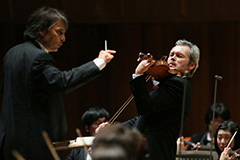 The PMF Orchestra, conducted by Osmo Vänskä, Domingo Hindoyan, John Nelson, and Yutaka Sado, took on 4 concert programs consisting primarily of Beethoven's Symphony No. 9, Schumann's Symphony No. 2, Sibelius' Symphony No. 2, and Shostakovich's Symphony No. 5. 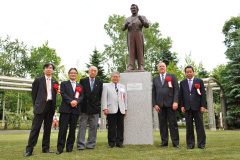 Additionally, various 25th anniversary events were implemented, including Special Concerts honoring PMF-founder Leonard Bernstein, the Hokkaido premiere of the R. Strauss Stage Opera "Ariadne auf Naxos," and the creation and placement of the Bernstein Statue. Concerning education, the Academy was instructed once again by a faculty consisting of PMF EUROPE and PMF AMERICA (continuing on from 2013), and seminars aimed at Sapporo students were presented by Berlin Philharmonic Brass members and Sergei Nakariakov (trumpet). Chosen from among the 1257 who auditioned, 108 Academy members from 20 countries and regions participated. In addition, 2 young musicians from Asia were invited as　part of the Asian Friendship Academy. PMF EUROPE and PMF AMERICA were led primarily by Principal Conductor Jun Märkl and Guest Conductor Alexander Vedernikov, and the faculty was enriched by members of the Wiener Philharmoniker, after a year's hiatus. 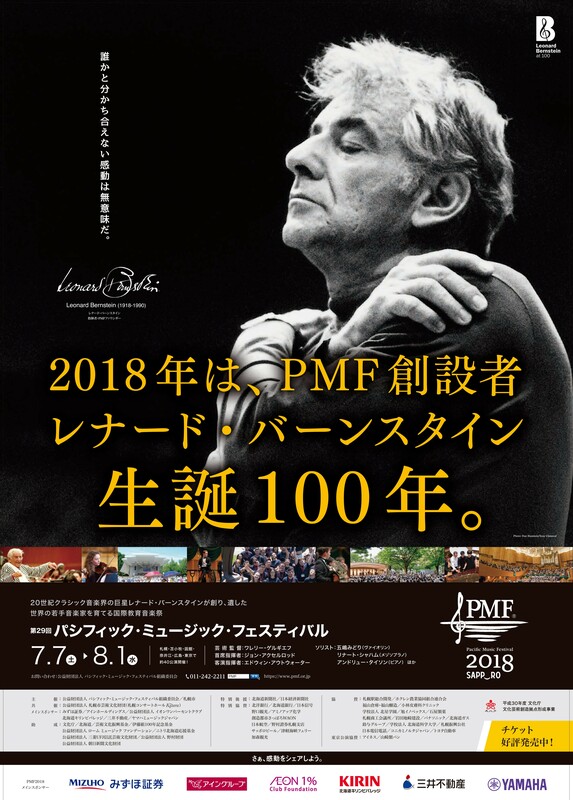 The PMF Orchestra presented the results of their hard work through various programs, including the 5th Symphony of Mahler and the Symphonie Fantastique by Berlioz, in locations including Sapporo, Sendai, and Tokyo. In addition, Carnegie Hall's music education program aimed at elementary school students, "Link Up," was held in Japan for the first time. 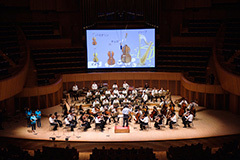 About 450 students from 6 Sapporo city schools sang and played recorders together with the PMF Orchestra, to much acclaim. 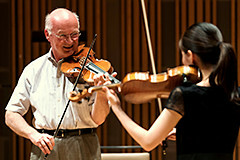 One hundred and twenty three young musicians from 27 countries and regions were selected from 1,346 audition applicants. Furthermore, three young Asian musicians were invited to participate in Asia Friendship Academy. 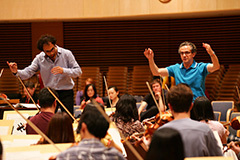 Fabio Luisi, as the final year of the term, coached PMF Orchestra Academy, PMF Conducting Academy and PMF Vocal Academy with members of PMF Faculty. 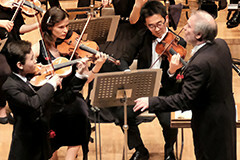 PMF Orchestra performed "PMF GALA Concert" for the first time in the final concert at Sapporo Concert Hall Kitara. 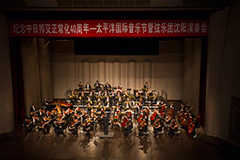 In commemoration of the 40th anniversary of the normalization of diplomatic relations between Japan and China, PMF Orchestra performed its first concert outside Japan in Beijing and Shenyang, China. One hundred and fourteen young musicians from 21 countries and regions were selected from 1,363 audition applicants. During the initial period of uncertainty that followed the Great East Japan Earthquake of March, there was some resevation about holding PMF 2011. 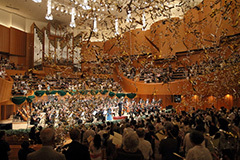 However, PMF Organizing Committee was encouraged to hold PMF 2011 by the maestro Fabio Luisi with his second season as the festival's Artistic Director, faculty members and many young musicians around the world, and decided to host the event this year according to schedule with the hope that it will spread even a little bit of encouragement throughout Japan, using the slogan "Ganbare Nippon Ganbarou Nippon." This year is the 100th anniversary of the death of Gustav Mahler and PMF Orchestra challenged his works and three orchestral program. The newly started Conducting Academy was taught by maestro Luisi, and had a chance to play with PMF Orchestra. Ninety one young instrumentalists and eight singers from 17 countries and regions were selected from 1,407 audition applicants. 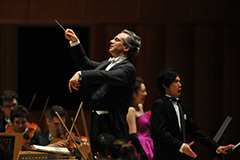 Fabio Luisi was appointed to be Artistic Director and featured an opera for the first time in 14 years. 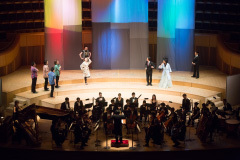 The PMF Singers and PMF Orchestra performed Puccini's Opera "La Boheme" in concert style. PMF Faculty members included the Tokyo String Quartet and the principal players from renowned orchestras in Europe and the United States. Twelve Alumni members also joined the festival as PMF Chamber Players to perform at the outreach program concerts. 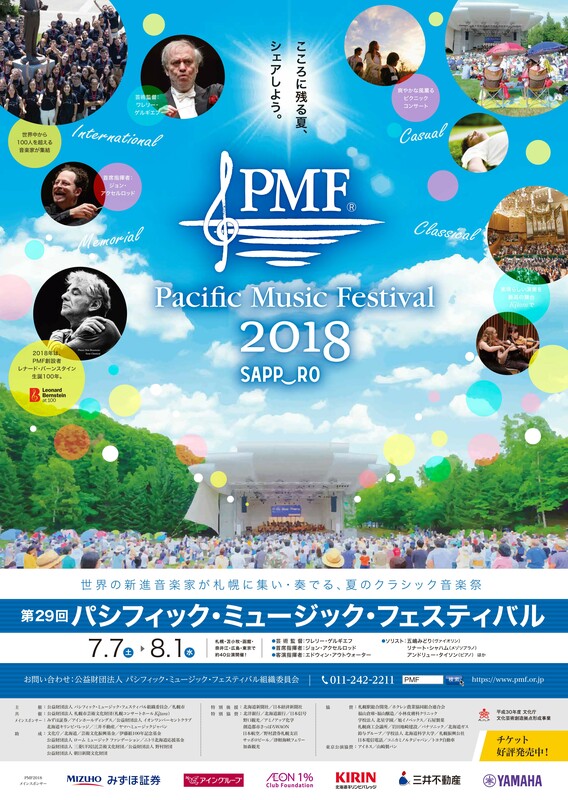 In August, 2010, Pacific Music Festival Organizing Committee was authorized as a Public Interest Incorporated Foundations by the Government of Japan Cabinet Office.